Also in this series: 1-5, 6-10, 11-15, 16-20, 21-25, 26-30, 31-35. Kyle Waldrop wasn't added to the 40-man roster following a standout season at Triple-A in 2010. He went unpicked in the Rule 5 draft that winter, returned to Rochester, had a worse season in nearly every possible way, and was added to the 40-man roster and called up in September. That doesn't make a ton of sense, even considering the Twins' injury wrecked roster last season, but does suggest that they view him as a potentially useful bullpen option. Waldrop was a first-round pick back in 2004, shifted to the bullpen following shoulder surgery in 2008, and is already 26 years old, so there isn't much upside beyond what he's shown already. And that hasn't been particularly impressive, as his fastball typically resides in the high-80s and he's managed just 5.6 strikeouts per nine innings at Triple-A. That includes a measly 44 strikeouts in 79 innings there last season. What he does well is throw strikes and keep the ball on the ground, which could be enough to make Waldrop a decent middle reliever if he can keep his strikeout rate from falling further against big leaguers. He induced 65 percent grounders in two years at Triple-A and anything above 55 percent in the majors qualifies someone as an extreme ground-ball pitcher. Waldrop will compete for a low-leverage role this spring and should get a chance to sink or swim soon. Anderson Hidalgo's quest to become one of the shortest third basemen in big-league history at 5-foot-9 hit a snag last season, as he followed up a strong showing at low Single-A in 2010 by losing 100 points of OPS in the move to high Single-A. His raw totals were better than they look because the Florida State League as a whole slugged .386, but with just six homers and 29 total extra-base hits in 100 games his Isolated Power was slightly below league average. Hidalgo got away with the lack of power in the past because he hit at least .290 in each of his first five professional stops, but his batting average dropped to .274 last season. Maintaining similar strikeout and walk rates suggest that Hidalgo wasn't overmatched at high Single-A, but then again he didn't make tons of contact or draw a bunch of walks to begin with. At age 23 there's still time for Hidalgo to develop, but his low-minors success no longer means much. Among active big leaguers listed at 5-foot-10 or shorter only Placido Polanco, Chone Figgins, Nick Punto, Maicer Izturis, and Alberto Callaspo have 250-plus games at third base. Hidalgo lacks the speed and defensive chops to seamlessly fit into that group, but coincidentally or not his offensive upside could be pretty close. Polanco is the high end, Punto is the low end, and somewhere in the middle would be hitting around .275 with doubles power and a .725 OPS. Named after his future Hall of Famer father, Ivan Rodriguez, junior goes by Dereck Rodriguez and was the Twins' sixth-round pick last year out of a Florida high school. Pudge is still trying to stick around at age 40 for a 22nd season in the majors, but he won't be able to hang on until his son is ready to join him. Dereck made his pro debut in the rookie-level Gulf Coast League and hit just .156 with zero homers and 35 strikeouts in 29 games. While his MVP-winning father is one of the greatest catchers in baseball history, Rodriguez is an outfielder who saw time in all three spots during his debut. He does have his dad's arm, but he'll be trying to gun down runners at the plate instead of trying to throw them out from behind it. If he sticks as a position player, that is. Before the draft there was talk of some teams preferring Rodriguez as a pitcher because they liked his arm and questioned his bat. For now there's no talk of the Twins encouraging a switch to the mound, but Rodriguez will have to show that he can hit following such an ugly--and albeit brief--debut at the plate. Rodriguez is 6-foot-1, but just 175 pounds and won't be 20 years old until June. Of course, by the time Ivan was 20 years old he was already in his second season as the Rangers' starting catcher, made his first of 16 All-Star teams, and won his first of 13 Gold Gloves. Good luck, kid. He was all tools and projection when the Twins took him out of a Florida high school in the 10th round of the 2010 draft, but JaDamion Williams showed last season that there's also a good baseball player beneath all the speed and athleticism. He struggled in his pro debut, hitting just .214 while playing primarily second base in the rookie-level Gulf Coast League, but switched to the outfield while moving up to rookie-level Elizabethton last season and thrived. He batted .317 with 17 extra-base hits, 25 walks, and 10 steals in 50 games, joining Miguel Sano and Eddie Rosario in an Elizabethton lineup that scored six runs per game. Williams struck out too much, whiffing 58 times in 212 plate appearances, and the move to right field means he'll have to keep putting up big numbers offensively to make a significant impact, but as a toolsy 21-year-old that's certainly within reach. Williams still hasn't faced full-season competition yet, so expectations should be held in check, but he'll make the jump to Beloit this year and is definitely someone to keep an eye on when checking low-minors boxscores. It'll be interesting to see if the Twins have completely given up on the idea of him playing the infield, because being even a passable option at second base or third base would dramatically alter his upside. In the low minors Tyler Robertson looked like a future mid-rotation starter, but his strikeout rate deteriorated as he moved up the organizational ladder and injuries further pushed him off course, leading to the Twins shifting the 2006 third-round pick to the bullpen at Double-A last season. At the same level the previous season Robertson got knocked around for a 5.41 ERA and .308 opponents' batting average, but he performed like a totally different pitcher in relief. Robertson appeared in 55 games and logged 90 innings with a 3.61 ERA and .252 opponents' average, inducing two ground balls per fly ball. He also had nearly as many strikeouts (88) in 90 innings as he did (91) in 145 innings as a starter, including a 41-to-11 strikeout-to-walk ratio in 35 second-half innings. In one year repeating Double-A he went from an afterthought left unprotected in the Rule 5 draft as a starter to added to the 40-man roster as a reliever. However, while that's plenty encouraging Robertson's upside is still limited by mediocre control and underwhelming velocity. Those weaknesses are muted somewhat as a reliever, especially when spotted mostly against left-handed batters, but Robertson is far more likely to develop into a useful situational southpaw than an impact setup man. Hanging on to last year's success while moving up to Triple-A could put him in the Twins' bullpen mix by the second half. • Changes in the new collective bargaining agreement inked last week benefit the Twins in the short term, as offering Matt Capps arbitration is no longer required to receive a compensatory draft pick for the free agent. Under the old system they wouldn't have risked offering Capps arbitration because he could have simply accepted and locked the Twins into a one-year deal for around $8 million, but the changes basically equal a free, no-risk draft pick for the reliever. Assuming, of course, that the Twins don't re-sign Capps themselves. Not only has Terry Ryan already ruled out Glen Perkins replacing Joe Nathan as closer, he's repeatedly talked about wanting the role filled by someone with previous closing experience and the Twins have made no secret about attempts to re-sign Capps. For the right price and the right role Capps would be fine, but re-signing him makes much less sense now that his leaving would net a draft pick. Perkins can potentially be more valuable as an all-purpose setup man, so not handing him the closer job is fine, but Ryan's quotes about searching for an experienced closer bring back bad memories of the Twins talking up Capps as a "proven closer." I noted last week that the three best closers in team history each had zero experience before taking over as Twins closer, so you'd hope that and Capps' failure would have taught them to value ability over experience. Nathan, who has the most saves in Twins history, was 29 years old and had one career save when they made him a closer. Rick Aguilera, who has the second-most saves in Twins history, was 27 years old and had seven career saves when they made him a closer. Eddie Guardado, who has the third-most saves in Twins history, was 30 years old and had never saved even 10 games in a season when they made him a closer. Closers are created, not born. • Michael Cuddyer and Jason Kubel also saw their free agent statuses change slightly as part of the new collective bargaining agreement, but unlike with Capps the end result is basically the same. If they sign elsewhere the Twins get two draft picks for Cuddyer and one draft pick for Kubel, and in both cases arbitration still had to be offered to be eligible for compensation. They'd gladly welcome Cuddyer or Kubel back on one-year deals, so the Twins happily offered. Cuddyer's leverage is even stronger under the new system, because teams no longer have to forfeit their first-round pick to sign the Type A free agent. Instead the Twins would receive the same first-round pick and supplemental first-round pick for his leaving, but the first-rounder is now created from scratch rather than taken from a signing team. That should lead to an even stronger market for Cuddyer, but his odds of re-signing already seemed pretty slim. • Gene Glynn, a 55-year-old Minnesota native who spent the past five years as a scout for the Rays, is the Twins' new Triple-A manager. He hasn't managed anywhere since 1992 and never managed above rookie-ball, but Glynn spent 13 years on major-league coaching staffs under managers Don Baylor and Felipe Alou. Glynn also grew up a Twins fan, was Minnesota's first "Mr. Basketball" in 1975, went to Mankato State, and played seven seasons in the minors. Joe Christensen of the Minneapolis Star Tribune notes that Glynn scouting Twins players for the Rays played a big part in the trade that sent Matt Garza and Jason Bartlett to Tampa Bay for Delmon Young, and minor league director Jim Rantz revealed that the Twins tried to hire him multiple times in the past. Toss in all the glowing reviews from various big names he's worked with over the years and on paper at least Glynn is an ideal fit. Rochester fired manager Tom Nieto and hitting coach Floyd Rayford after going 102-186 over the past two seasons, losing 90-plus games in back-to-back years for the first time since 1904. Pitching coach Bobby Cuellar held onto his job and will join new hitting coach Tom Brunansky on Glynn's staff. They won't have many top prospects to work with next season, but the Twins have signed a slew of minor-league veterans in an effort to make Rochester competitive again. • Daryl Thompson is the latest of those Triple-A pickups, agreeing to a minor-league deal with the Twins after spending the past six seasons in the Reds' system. Thompson was originally the then-Expos' eighth-round pick in 2003 and was sent to the Reds as part of an eight-player swap in 2006. Cincinnati's general manager at the time was Wayne Krivsky, who rejoined the Twins' front office as a special assistant and has brought in several of his former players. Thompson is a 26-year-old right-hander with 17 innings in the big leagues and 711 innings in the minors, primarily as a starter. He was never considered a particularly good prospect and fits the Twins' mold as an extreme fly-ball pitcher with a low-90s fastball and good control. This year between Double-A and Triple-A he had a 123-to-40 strikeout-to-walk ratio and 4.26 ERA in 137 innings, allowing 18 homers and a .280 batting average. When Rodriguez signed with Lozano in May, it raised questions: Rodriguez's contract runs through 2017, and his endorsement deals are handled by another agency, so there's little a new agent could do for him. But Rodriguez is reportedly doing plenty for Lozano. According to agents familiar with the South Florida baseball scene, Lozano has repeatedly used Rodriguez as a recruiter for young talent. Over the winter, even before Rodriguez made it official with Lozano, he was seen hanging out with a trio of highly ranked Miami-based prospects: the Orioles' Manny Machado, the Reds' Yonder Alonso, and the Twins' Danny Valencia. A South Florida-based agent says Rodriguez was the elder statesmen showing the kids a good time: parties, events, and just chilling at his condo. In February, all three left their current agencies and signed with Dan Lozano. Deadspin alleges that Rodriguez got a piece of Lozano's agency in exchange for helping recruit Danny Valencia and others. None of which suggests Valencia did anything wrong, of course. Well, other than choosing an agent who's now being called "the king of sleaze mountain." • Kansas City re-signed Bruce Chen to a two-year, $9 million deal, which seemed funny until Jon Heyman of SI.com reported that the Twins and Cubs "were the main other teams showing interest" in the 34-year-old southpaw. If true the Twins dodged a bullet and the fact that they even targeted Chen is disappointing. He posted some decent-looking ERAs, but throws in the mid-80s with poor secondary numbers, including xFIPs of 5.22, 4.79, and 4.68 from 2009-2011. • Javier Maymi of ESPN.com notes that Ivan Rodriguez and Dereck Rodriguez "became the first father-son tandem in history to play for the same team in the Puerto Rico winter league." Dereck was the Twins' sixth-round pick this year and Maymi reports that they're thinking about switching the 18-year-old from outfielder to pitcher. He debuted in rookie-ball and hit just .156 with zero homers and a 35-to-5 strikeout-to-walk ratio in 29 games. Last week I wrote about the Twins' trio of first-round draft picks, noting that they abandoned their usual focus on toolsy high school outfielders and strike-throwing college starters to use first rounders on a college position player (Levi Michael) for the first time since 1997, a high school pitcher (Hudson Boyd) for the first time since 2004, and a bat-first high school position player (Travis Harrison) for the first time since 2006. Those three picks were very intriguing within the context of the Twins' usual draft strategy and obviously first rounders (and supplemental first rounders) are the selections everyone focuses on, but they also made 49 other picks on Day 2 and Day 3 of the draft. 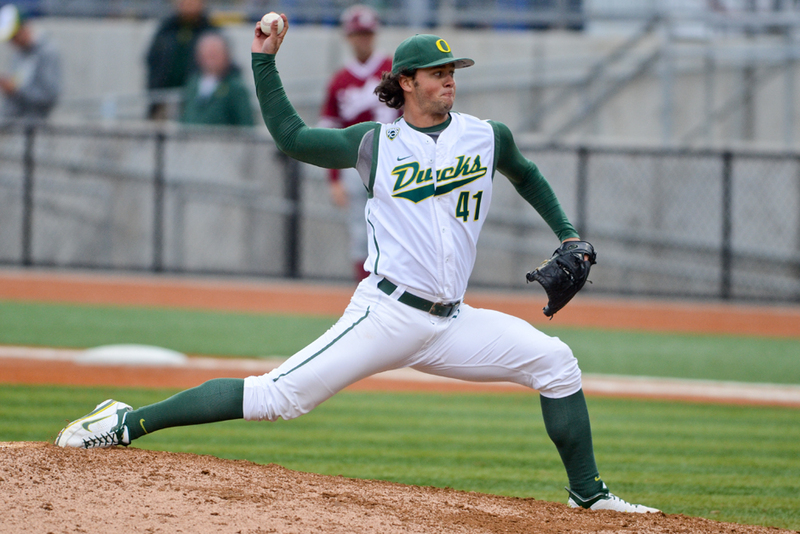 They resumed focusing on college pitchers, taking Oregon righty Madison Boer in the second round, Vanderbilt lefty Corey Williams in the third round, and UC-Irvine righty Matt Summers in the fourth round. In all 22 of their final 49 picks were used on college pitchers, including University of Minnesota right-hander Trevor Oakes in the 41st round. However, the Twins did continue to stray from their usual strategy by loading up on college shortstops even after grabbing Michael with the 30th overall pick. They took Tyler Grimes from Wichita State in the fifth round, Adam Bryant from Troy in the ninth round, and Gophers shortstop A.J. Pettersen in the 25th round. Whether or not any of those four college shortstops will provide help for the Twins in the near future remains to be seen, but using their first pick and three of their first 11 picks on college middle infielders is a pretty clear sign that the organization made it a priority to address the lack of MLB-ready depth at shortstop and second base. I'm not sure what took them so long to adopt that approach, but I'm glad to see them finally do so. Grimes made a ton of errors this season, but according to Baseball America he "has better tools than most college shortstops" and "has a strong arm and can make nifty plays." Offensively he hit .300 with modest power, but like Michael showed excellent plate discipline by drawing 57 walks in 65 games for a .467 on-base percentage. He also struck out 61 times, however, and Baseball America notes that he "plays out of control at times." Bryant wasn't a walk machine like Michael and Grimes, but hit .337 and slugged .570 with more walks (26) than strikeouts (25) in 62 games. It sounds like he may have to move to second base, with Baseball America calling Bryant's arm strength "fringe-average." In addition to those college shortstops the Twins also drafted one high school shortstop, Brian Anderson, using a 20th-round pick on "the best prep position player in Oklahoma" according to Baseball America. While loading up on college shortstops and pitchers the Twins did take one toolsy high school outfielder, sixth-round pick Ivan Rodriguez, who goes by Dereck Rodriguez and is the son of future Hall of Fame catcher Ivan Rodriguez. As you might expect arm strength is Rodriguez's best skill and some teams reportedly liked him as a pitcher. Not only is his dad still playing at age 39, he's backing up former Twins prospect Wilson Ramos in Washington. During the previous 11 drafts the Twins used a first rounder on a college pitcher 10 times and took at least one college pitcher within the first 75 picks every year but 2001, 2006, and 2007. This year Boer was the first college pitcher at No. 87 after the 6-foot-4 righty from Eden Prairie had a 2.27 ERA, .234 opponents' batting average, and 74-to-35 strikeout-to-walk ratio in 99 innings as a junior at Oregon. If you're too squeamish to actually watch the video or look at the X-ray a line drive back up the middle broke Williams' knee cap and he somehow still managed to pick up the ball and flip it to first base for the out while writhing in pain on the mound. Summers has no such YouTube-able moments, but the fourth-round pick successfully made the transition from outfielder to pitcher at UC-Irvine with a 2.02 ERA and 99-to-32 strikeout-to-walk ratio in 116 innings. This week's content is sponsored by the Minnesota computer repair shop TCPC Services, so please help support AG.com by considering them for your computer problems.